BUSINESS THAT "YOU OTHERWISE WOULD NOT HAVE"
All of the large real estate franchises have charitable programs with which their agents can collectively make significant donations to non-profits. Usually these are charities created specifically by each franchise. The individual Realtor's contribution to these funds may be modest, but collectively, they are significant and accomplish some wonderful results in their communities. REBSEA is a different program altogether. The REBSEA model is about real estate agents and mortgage lenders doing business that 'they otherwise would not have'. It is a program where supporters of nonprofits and socially conscious consumers are contacting our members specifically because of their willingness to donate to worthy causes. Our members make a donation at closing to a nonprofit in their community, much like a referral fee (with the amount determined by each member). The guiding principle that makes this model so powerful is that RE agents routinely and gladly pay referral fees to other agents 'for business that they otherwise would not have', so, why would they not donate to nonprofits when the public chooses to do business with them because it benefits their community as well. Another reason that the REBSEA model is so powerful is the fact that a major trend in business today is for consumers to look for and favor businesses who demonstrate that they support the communities they serve. The MBA programs in all of our leading colleges and universities teach that this is a trend that is not going away, but rather, will reshape commerce as we know it in the coming years. When a sustainable business is coupled with a social benefit it is called Social Enterprise. Social Entrepreneurs create innovative models for harnessing the power of business to solve our social and environmental problems. The younger generations today are very open to social innovation. They are already demonstrating a deeper sense of social responsibility and a deeper connection to their community. This is a seldom mentioned benefit of the information age. Like minded people are far more connected to each other than ever before and able to 'make things happen' when they believe strongly in an idea or a cause. Once any new movement or change of any kind reaches a certain 'critical mass' it can and will 'go viral' and spread through the culture almost overnight. You can look for this to happen to REBSEA and other forms of Social Enterprise as they are 'discovered' and seen as new and innovative models to handle and solve old problems. Why wait? You can join this trend now! 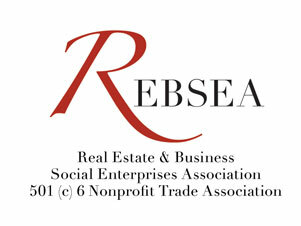 Support Social Enterprise in the real estate industry by joining REBSEA as a Charter Member for your community. Only GOOD can come from it !